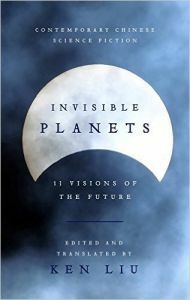 Not to be confused with Hannu Rajaniemi’s recent debut collection of the same name, this Invisible Planets is an anthology of contemporary Chinese SF in translation. Ken Liu is the editor and also the translator of all the stories, most of which have appeared in some of the top SF venues over the past few years. Coming hot on the heels of my reading Liu Cixin’s Three-Body Trilogy and then interviewing both Ken Liu and Liu Cixin, I was decidedly in the mood for some more Chinese Science Fiction.